Yes, absolutely adorable, but people do forget that parts of China do get well below freezing in winter (Harbin has an ice festival), so this may not have been as much of a shock for this panda, as some might have thought. He had probably never seen anything quite like it in Washington, mind. I’m actually putting up tips for a site, on Facebook. No, not anything I dont like, like football, or stuff I dont think I know enough about, like horse racing, but on the sports I think I do, like American Football, and Golf. And fine, I’m doing a decent job on it, even more so after posting a number of winning selections for the Carolina game on Sunday. Not getting paid, but at least its keeping the mind ticking over, if not assisting the ever decreasing bank balance! There is a very good subscription service there too, I might add. Any gamblers who want details, ask at any of my many routes of contact (Here, Facebook, Twitter), and I’ll provide you with them. But at the moment at least, I’m just posting on the non subscription board, along with a few others. What happened last week was that someone posted suggestions for one of the all weather meetings, and they didnt do very well. Someone else took note of them, backed them, and lost money, and then proceeded to call the whole thing a group of muppets, or something like that. At which point silliness abounded, and the Miss Piggy jokes started to flow, and developing into a few other muppet characters for other regulars. The trouble is, both us ladies fancied being Miss Piggy, but anyway…a few photos went up about it, great fun. Oh, and me, I love the whole dress up idea, whether you call it cosplay, or just dressing up, take your pick. So yes, fine, I commented that I’d happily dress up in any of those type of suits, given the outfit, and given the chance. But fine, especially at the moment, I’m in no position to buy any for myself! But if anyone wants to get me something, I’ll definitely provide photos, though I cant guarantee playing in the snow, around here! I know, not going to happen, but it would be fun! 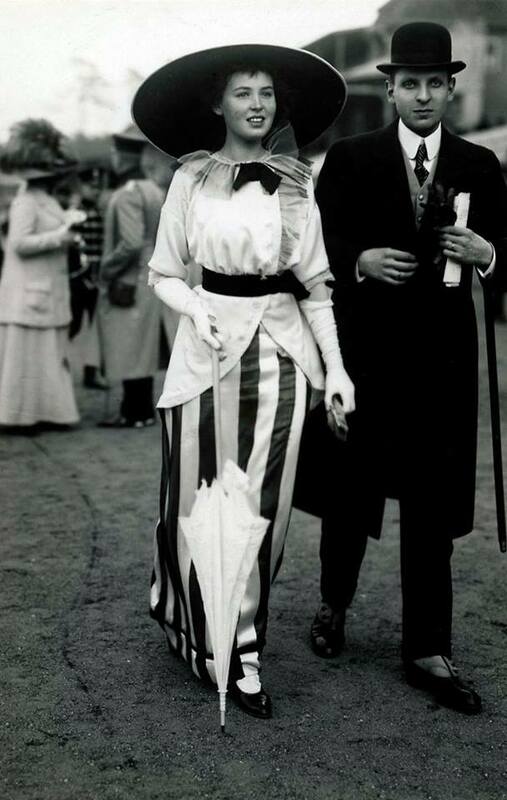 Oh, and one last photo before I sign off, this got posted on one of the many vintage type boards I inhabit on Facebook today, a couple at the races, about a century ago. Not quite what I’d normally wear to go to Doncaster races on Saturday (if invited), but I would if the outfit was provided, you bet I would!